One can add garlic and ginger too. I do not add it. Wash the leek thoroughly. Open each of the green leaves, as it contains mud particles. Wash them under running water. Cut the white portion into 1-2 inch lengthwise and around 1 cm in width. Cut the potato in 4 pieces. In a pressure cooker, add oil. 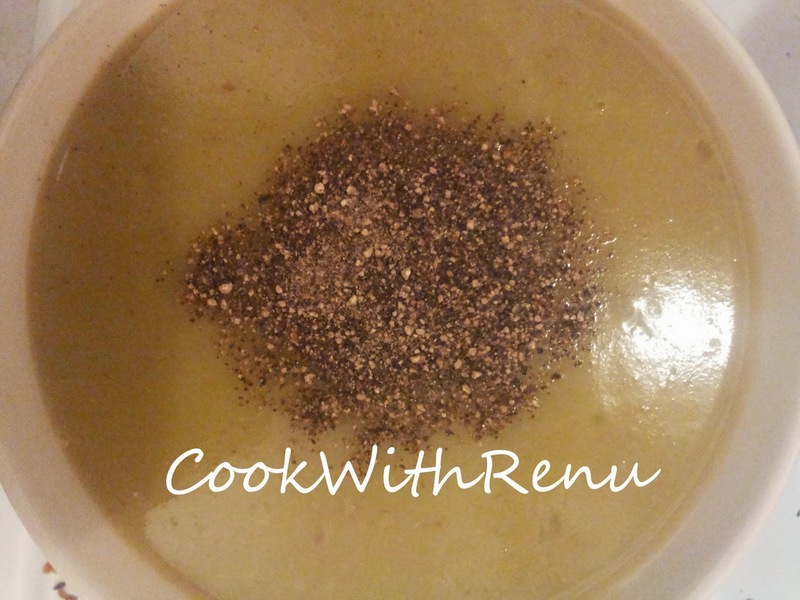 Once hot cumin seeds, Once it crackles add the white part of leek. Let it saute for a minute. Now add the green part of leek (I use this, it’s upto you if you wish to discard it) and the potato and saute for a minute. Add salt and just enough water to pressure cook it. Pressure cook it to 3 whistles(depends on your cooker). If using a pan, let it boil until soft, or steam it. Once cooled, blend the mixture to a smooth paste in a mixer. Sieve it. Add more water to desired consistency. Cook the mixture on medium heat. Let it boil for around 5 minutes. Do stirr in between as it contains potato and it does stick to the bottom. Garnish it with black pepper and serve it hot .